Treatment for Left Breast Cancer at Sharp Memorial Hospital in San Diego. For patients with left-sided breast cancer, a special device may be used to help a woman hold her breath during radiation treatments. The ABC, or Active Breathing Coordinator, is a type of device used for this purpose and is offered at our Sharp Memorial treatment center. 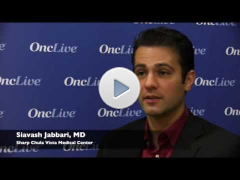 Siavash Jabbari, MD, radiation oncologist, Douglas & Nancy Barnhart Cancer Center, Sharp Chula Vista Medical Center, discusses the potential for implantable cardiac devices to malfunction following radiation therapy. Radiation therapy is becoming a bigger player in the management of all stages of lung cancer. However, Jabbari says, there is a known potential issue of radiation causing implantable cardiac devices to malfunction. This could be catastrophic to a patient. While it is possible to risk-stratify and manage patients who receive radiation therapy, there are practical and logistical barriers to evaluating each pacemaker/device. © 2019 - (XRO) X-Ray Medical Group Radiation Oncology, Inc.